Dioscorea Esculenta or Lesser Yam is one of vegetables which can be eaten. This kind of vegetable contain high carbohydrates so it can replace rise as a staple food. 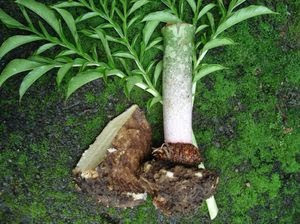 This vegetable can easily be found in tropical region, like Indonesia. Even, in several tropical country, this kind of food can be used as secondary food. The shape of this fruits is usually round, even some of them have oval shape. The color of flesh tuber is white and yellowish. Color skin of Lesser Yam is cream and some of them light brown. In the event of a food crisis, Dioscorea esculenta widely used as replacement food. But, because the part of its trunk are usually spiked and the age of this plant is so long, finally most of people not interested to cultivate this plant. However, if observed, this commodity is very promising for the future. If we look at West Africa, Dioscorea esculenta used for industrial making starch. The largest component of Dioscorea esculenta is water and carbohydrates. carbohydrates contained within these tubers is composed of sugar, amylose and amylopectin. Sugar component composed of glucose, fructose and sucrose causing sweetness. Protein in the Lesser Yam is composed of amino acids that the amount is low, such as sulfur amino acids (methionine and cysteine), lysine, tyrosine and tryptophan. While, other amino acids have large amount in this fruit. Lesser Yam has highest tuber flour and starch flour (approximately 24,28% and 21.44%) if compared to other tuber. Therefore, Lesser Yam is also very potential to be developed into flour or starch. Lesser Yam is a potential source of carbohydrate, protein, low-fat, calcium, phosphorus, potassium, iron, dietary fiber, vitamin B6 and C. Beside that, Lesser Yam has a sodium content and low glycemic index. Lesser Yam can be used as a food supplement or meal replacement, but it also can support efforts to diversify foodstuffs, so it does not depend on rice. In the west African, this tubers used as an industrial material starch and alcohol. Various processed product from Lesser Yam. 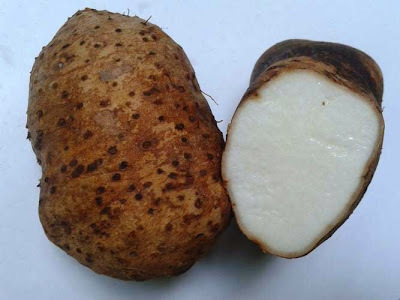 In order to have a higher added value, people have tried to cultivate this yam tubers into various refined products which are more varied and more attractive appearance and also the taste. That processed products, can be directly consumed (finished product) or as a semi-finished foodstuffs like flour, which further can be processed into a variety of food products ready for consumption. Processing can be done by farmers, small industries and large industries. Yam tubers can be processed into food products, for example made of flour, chips, cooked dried. Utilization of Lesser yam can be enhanced by utilizing flour and starch as a substitute material in the manufacture of processed products such as cakes, instant noodles, crackers and others. A researcher said flour can be substituted by flour of crops, sorghum and maize. The local flour can substitute in the manufacture of instant noodles (20%), cakes (30-50%), bread and the like (20%), pastries (50- 100%) and other traditional foods. Lesser Yam after cooking or baking, the taste is very sweet and tasty, eaten as food additives. Lesser yam can also be extracted into flour; fiber smooth, and easy to digest so it is used as a menu for people who have gastrointestinal disease. Coarse grater tubers can be used as a drug for swelling, particularly in the esophagus. Lesser Yam has a prospect that could produce products such as starch. Dried Lesser Yam leaves, can also be used as green manure. We can collect them and make it as a growing medium for plants Wijayakusuma, ferns, begonias, orchids or plants like ginger, galangal. 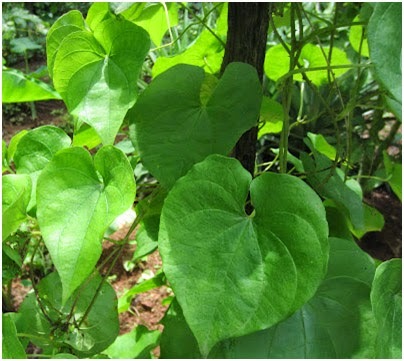 Many people believe that the Dioscorea esculenta leaves can cure asthma or shortness of breath.